By the end of 2504 IC all Elector Counts who had been part of the Empire under Luitpold had either pledged their allegiance to the new Emperor, or were dead. Franz had finally re-unified his father's Empire - there were no other Elector Counts remaining who could make a claim for the throne. 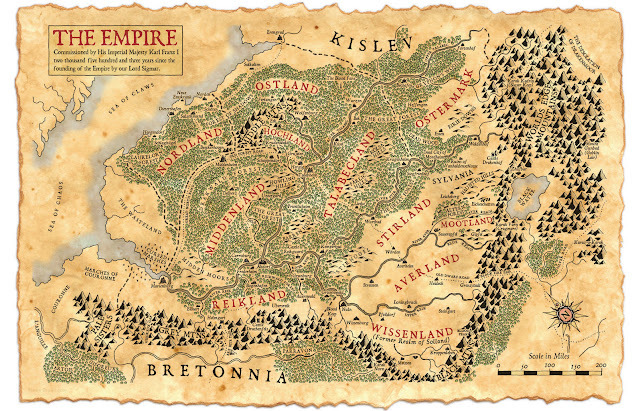 The territory controlled by Franz was smaller than his father's, however - Averland and the lower reaches of Wissenland remained in the hands of the Vampire Counts as per the Treaty of Wurtbad. Ostermark was a smoldering ruin. Nordland's coastal towns were constantly being ravaged by Norscans crossing the Sea of Claws and the Gulf of Kislev. The central Empire was dominated by an unprecedented host of Varg and Skaeling, in numbers never before seen in history. The Norscan invasion of 2502-2504 was without precedent, and ravaged much of the north and central Empire. Franz's great counter-offensive began from the staging town of Weismund in central Middenland. The army marched east towards Hergig and linked up with Ludenhof's Army of Hochland. From there the combined army swatted aside a pair of Varg armies and liberated the city of Hergig. Franz then headed south towards Talabheim. Crossing the River Talabec under the cover of mist and fog the Imperials made landfall on the southern bank at dawn and established a beachhead. Despite desperate attempts by the Varg to drive the growing number of troops back into the river Franz was able to hold thanks to the stout defense of the Middenlanders, and to a terrific cannonade from the north bank directed by Lennart Torstensson, a Dwarf artillery officer from Nuln. By noon most of Franz's army was south of the river. Swinging south and then looping around to the west the Imperial army hit Talabheim from the south, and drove the Varg garrison out of Talabheim. The Norscans showed time and time again their inexperience in siegecraft, being drawn to feints and demonstrations and failing to understand where the true point of attack would be. They also seemed to lack basic engineering skills, failing to repair breaches which they had wrought themselves. The Imperials took full advantage of these lapses at Middenheim, Hergig and Talabheim to win easy victories. 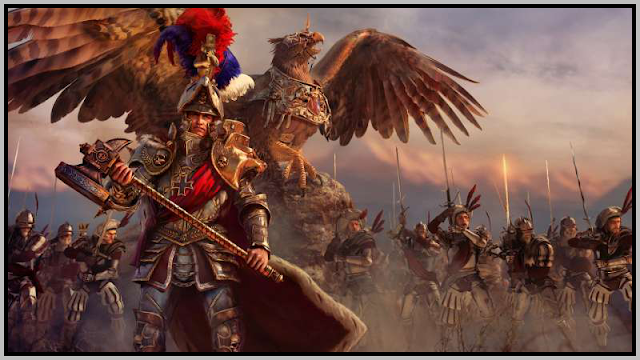 With Hergig and Talabheim once again in Imperial hands Franz took several weeks to rest and refit his army, as well as to impose order and secure his supply lines. In the meantime Ludenhof led the reinforced Army of Hochland north-east to recapture the capital of Ostland. A long and protracted siege ensued at Wolfenburg. The Varg had finally adopted the rudiments of siegecraft, and heavily fortified their position. Nonetheless the siege was finally broken when Franz's army came up from Hergig two months later. Franz astride Deathclaw was becoming a legend in the Empire. The sight of the Emperor flying overhead drew raucous cheers and raised hats from the soldiers. Wielding the mythical hammer of Sigmar, Ghal Maraz, and warded by ensorcelled artifacts and armor he was nigh unstoppable in battle. He was now supported by Imperial captains riding flying pegasi from the Grey Mountains. It takes a special form of madman to ride these flying mounts, but there was no shortage of volunteers in search for fame, riches and glory. At Wolfenburg Franz and his captains began the final assault by landing atop one of the walls and clearing away the troops stationed above. One of the captains was poorly secured in his saddle, however, and fell to his death, much to the discomfit of the troops watching below. Franz was determined to weld the triumvirate of Hergig, Talabheim and Wolfenburg into a formidable bastion that would hold the center of the Empire together, with each town mutually supporting one another in defense. Supplies and troops were poured in from Reikland, Middenland and Wissenland to this end to rebuild the cities. Human and Dwarf engineers worked tirelessly to restore the walls. Famine and disease were the biggest issues, and great pains were taken to dispose of the dead and bring forward sufficient grain for the coming winter. Franz established Wolfenburg as his furthest north-east stronghold, and from here Franz and Ludenhof led sorties to destroy marauding Varg armies, and to shepherd terrified refugees to safety. The north-eastern approaches of Ostland became a bloody battlefield, with armies marching and counter-marching ceaselessly and townships and hamlets changing hands on a weekly basis. Beyond Ostland, the nation of Kislev lay in ruins, and its people were reduced to nomadic bands of armed cossacks, or desperate refugees fleeing south-west towards Hochland. Franz halted the Imperial advance at Bechafen. The capital of Ostermark was a shattered, smoking ruin, and Franz did not deem it prudent to rebuild the city. Instead his army rounded up whatever survivors they could find, and returned to Wolfenburg for winter quarters. Major battles in the central Empire. Franz's counterattack took Hergig, then Talabheim, and finally Wolfenburg. The Imperials advanced as far east as Bechafen, but found it in ruins. With the onset of the snows Franz retired to Wolfenburg for winter quarters. While Franz and Ludenhof campaigned in the north-east Todbringer oversaw the rebuilding of Middenheim and Salzenmund in the north-west. The Count of Middenland was also responsible for repelling reavers attacking the northern coast. 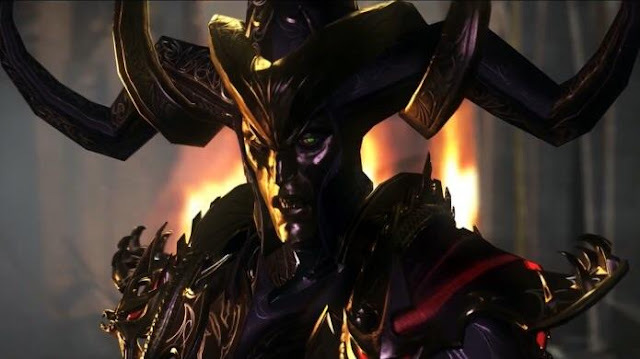 Todbringer, still stung by the loss of Middenheim under his stewardship, was determined to make amends for the lapse. He pursued and destroyed reavers making landfall with ruthless determination, giving no quarter to the Northmen. In the south Haupt-Anderssen, unwilling to trust Manfred Von Carstein, controlled an army which routinely patrolled the border between human and vampire territory. His route took him from Wurtbad, his own provincial capital, to the newly confederated city of Nuln. He was kept busy by sporadic incursions by the undead. Whether it was due to the overflow of dark magic spilling from vampire territories, or deliberate probes by Manfred looking for human weakness the raids kept Haupt-Anderssen busy and wary of a larger attack. Having distinguished himself with the defense of Wurtbad in 2502 IC he was obsessed with creating a strong line of defense from Nuln to Grunburg to Kemperbad to Wurtbad. All settlements along this "Greater Stirland Wall" were heavily fortified. Walls and palisades were erected, artillery emplaced, munitions stockpiled and militia raised and drilled ceaselessly. Haupt-Anderssen was strident in his belief that a vampire attack was a matter of when, not if. He clashed frequently with the Countess of Wissenland over the direction of supplies and munitions, seeking to divert most of the wagons destined for the central empire to the south. Emmanuelle Von Liebwitz repaid the favor of the Emperor by studiously ignoring the Count of Stirland and sending the supplies to where they were intended to go. We've chased the Norscans out of most of the Empire, but to finish them off we would need to cross the Sea of Claws and take the fight to the Norscan homeland. I've made peace with the Varg three times, and they've broken the pact each time. Their word means nothing. 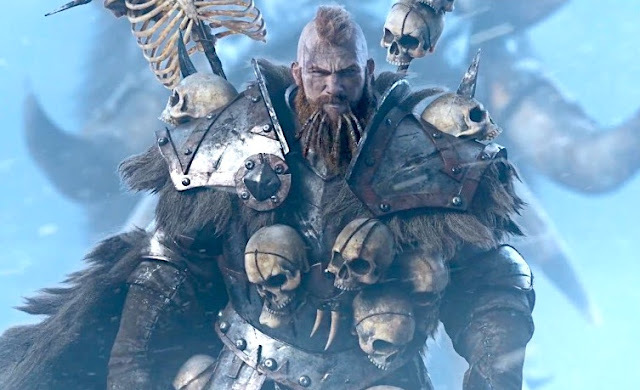 The Skaeling are a little bit more reliable, but from the first game I know that regardless of whether a peace holds or not the Norscan tribes will immediately declare war again once the Warriors of Chaos come sweeping down from the north-east. So as painful as it is, I have to cross the Sea of Claws and torch a bunch of Norscan settlements to break up their staging area. I don't think I'll be able to create lasting settlements there - I've tried in previous campaigns, but was foiled by the long build penalties due to the land being inhospitable to our faction. But I need to do something, otherwise I'll just be locked in an eternal cycle of repelling raiders from the north. I'm worried about a backstab coming from the Vampire Counts. With so many of our armies heavily committed in the north Haupt-Anderssen is the only line of defense we have if the undead turn on us. If I commit to an attack on the Norscan homeland the situation gets even worse. Franz and company will be on a different landmass and many, many leagues away from the border with the vampires. The good news is that having fought so many Norscan armies we know how to defeat them and what composition works the best. Franz and Ludenhof are both rocking large amounts of fast cavalry who have displaced the skirmishers we ran with earlier. The Norscans bring lots of foot infantry, no artillery and fast cavalry in the form of either chaos hounds or marauder cavalry. The game plan is always to take out the fast elements first, then run circles around their slow infantry and shoot them up, much like those old Westerns where Indians ran rings around wagons. The armies become dispersed and get taken out piece meal by our own heavy cavalry and by our Lords on griffons. Ludenhof is mounted on a griffon as well now, and he acts as Franz 2.0, using the same tactics as the Emperor. A traditional battle line works well too, but I prefer the cavalry armies because we take much less casualties and preserve our strength for multiple battles. I was about to say "Blood for the blood god", but then I realized that something like 'Sigmar for the Empire!' was more appropriate. No!!!!! Not another Khorne worshipper!!!! !